I began building instruments when I was 16 by taking scrap wood and mounting old microphone parts for pickups. Those experiments weren’t very successful but they sent me on a path to being a full time musical instrument maker. My first foray into acoustic instruments began in 1991 when I built a simple wooden banjo as a wood working project. 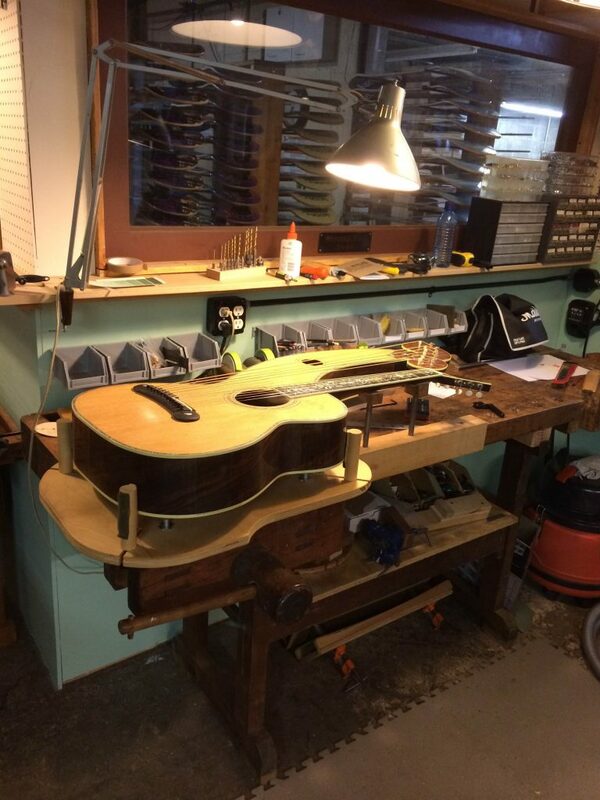 As I got my courage up I began to build acoustic guitars for myself and was amazed that the crude guitars I built played and sounded so much better than the nice looking factory guitars I owned. My playing took off to a much higher level and I was sold on the benefit of a hand made instrument. 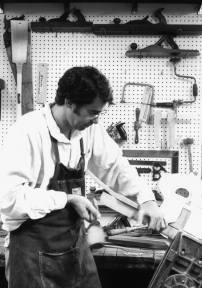 In 1997 I studied with Charles Fox and began to set up a guitar making shop. Eventually I was able to quit my day job as a design engineer and work on guitars full time. Currently I build custom guitars and other string instruments in my shop full time. I also teach guitar making on a one-on-one basis and occasionally take on an apprentice to help out. Simple or elaborate, the instruments I build are custom made according to whatever the customer wants. What I enjoy doing most is collaborating with artists and musicians in designing and building their dream instruments. The greatest payment I receive is to hear the new instrument being played by its new owner and seeing the smile on their face as they see and hear it for the first time. I am currently located in the Los Angeles area (Pasadena) so if you’re in the SoCal area feel free to come visit me at my workshop.